Verified Owner Comments: What I love about this watch is that it has really cool technology with an amazing design but is not overly blingy. The dial is extremely eye catching in person. I love the shiny black subdials. I bought this watch in particular because I wanted the dehumidifying technology and Diapal so that I wouldn't need to have it serviced as often. This makes it my daily wearer and since it is not overly blingy I don't worry about being mugged so I can wear it anywhere. Lastly, I like how this watch is rated to 200m of water resistance but the pushers are not the annoying screw down type. It's much more convenient. 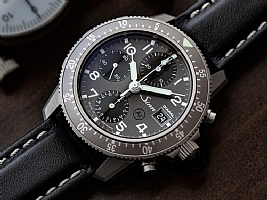 Verified Owner Comments: This is my seventh Sinn watch. (I still have six.) it exceeds expectations. The contrast the flat gray (dial and bezel) and glossy black (sub registers) is unique and very attractive. Pictures don’t do it justice. The display back is larger and more revealing than most making the decorated movement and blued screws very easy to see. I’m not a fan of screw down pushers for the chrono function. So for me, the plain pushers are an added attraction. While this is a thick watch, the lighter titanium case rests comfortably and securely on the wrist even with a strap. I substituted a medium gray padded sharkskin strap shortly after receiving the watch and the look is stunning. I highly recommed this watch. "Sinn 103 Ti Diapal - seamless transaction"
Verified Owner Comments: Great watch, good shipping prices, sales associate was available online for any questions.